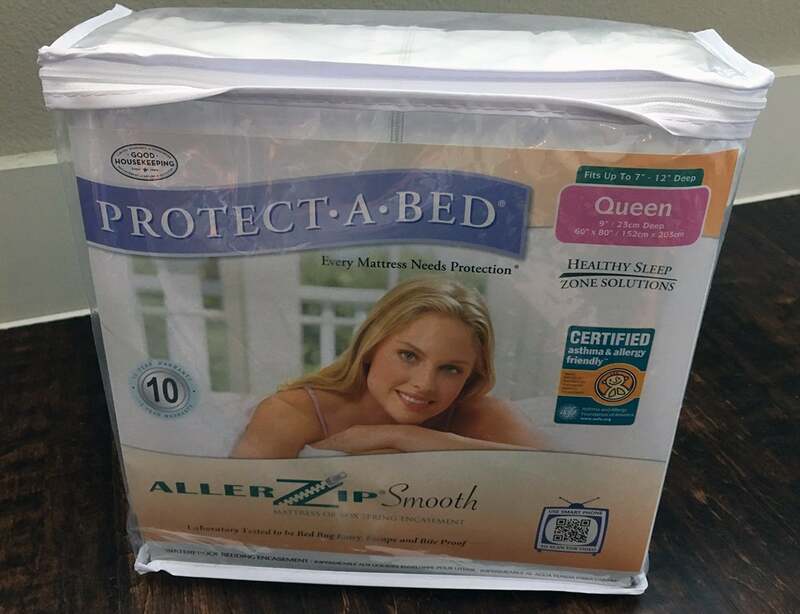 Protect-A-Bed’s AllerZip Smooth Mattress Encasement is great for people who have sensitivities and need serious protection against allergens. Did we mention it’s waterproof and bed bug proof as well? Read on for my full review. Protect-A-Bed’s AllerZip smooth encasement mattress protector is intended to protect your mattress from nearly everything, including liquid stains and damage. 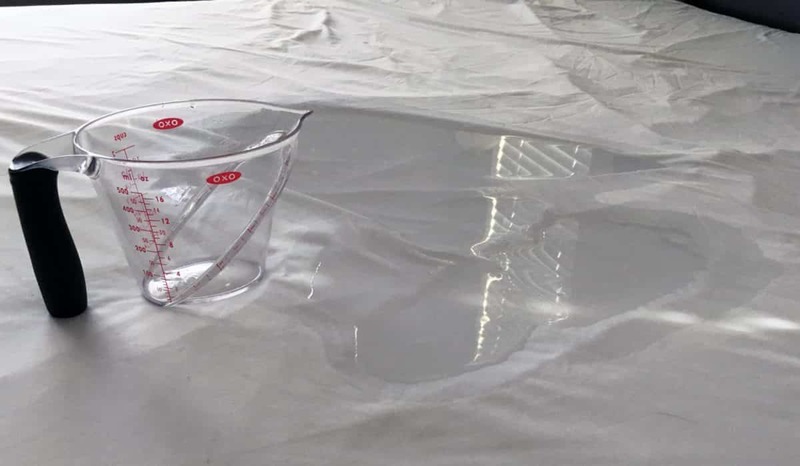 It’s very common for a mattress warranty to be voided for stains or other issues called by fluids or water, so choosing a mattress protector that has waterproof properties is always a good investment. To test the waterproof capabilities of the protector, I poured 10 ozs of water directly onto the center of the protector. I do this with all mattress protector reviews (waterproof ones, at least!). I want to make sure that it can handle what might be a realistic amount of liquid from a large spill or accident. I leave the water on the protector for a couple of hours, which is what might happen if someone has an accident overnight. The water seemed to spread out pretty far on the surface of my protector. I felt wetness down the sides even but fortunately, nothing leaked! The protector completely passed my waterproof test. Noise: The polyester fabric of the encasement protector does give it a very smooth feeling and not much “crinkling” sound or noise that can sometimes accompany waterproof protectors. 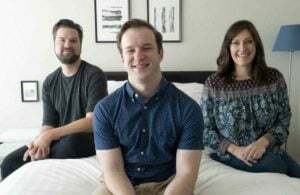 Size: Since mattresses come in all different sizes and depths, I really like that Protect-A-Bed offers two depth options to best fit your mattress. I have a 10-inch mattress and used the 9-inch size option. 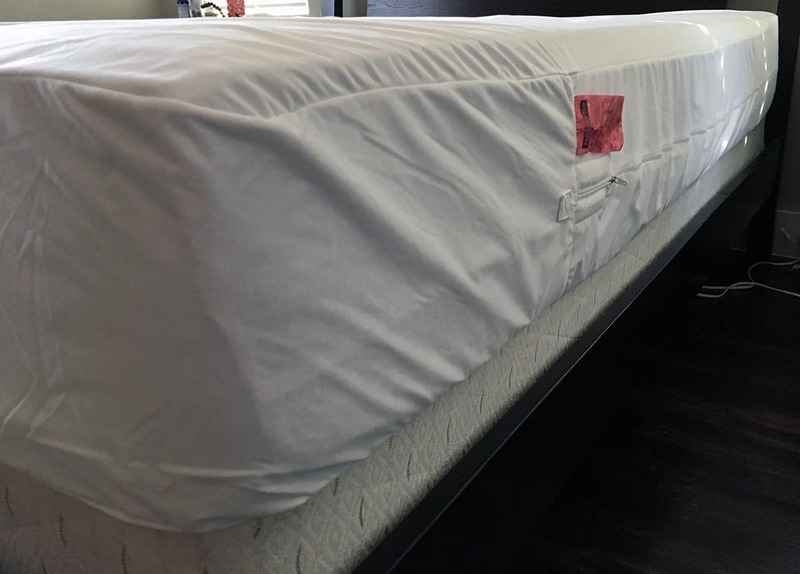 It fit really well on my mattress and I had no trouble getting it on or off my mattress when needed. Since it fit well, there was less extra material that could rustle around or slide when I moved in bed. Breathability: I did wake up a little hot on the nights I used this mattress protector. I can’t point to what exactly causes the build up of heat. 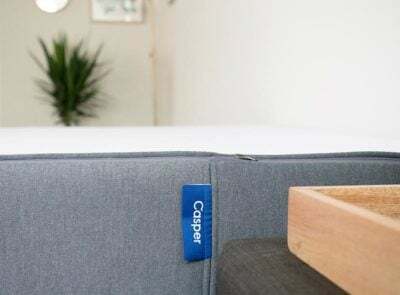 Previous mattress protectors with terry cloth surfaces that I’ve reviewed, like the Luna, Linenspa or Defend-A-Bed, were fine and left me comfortable overnight. 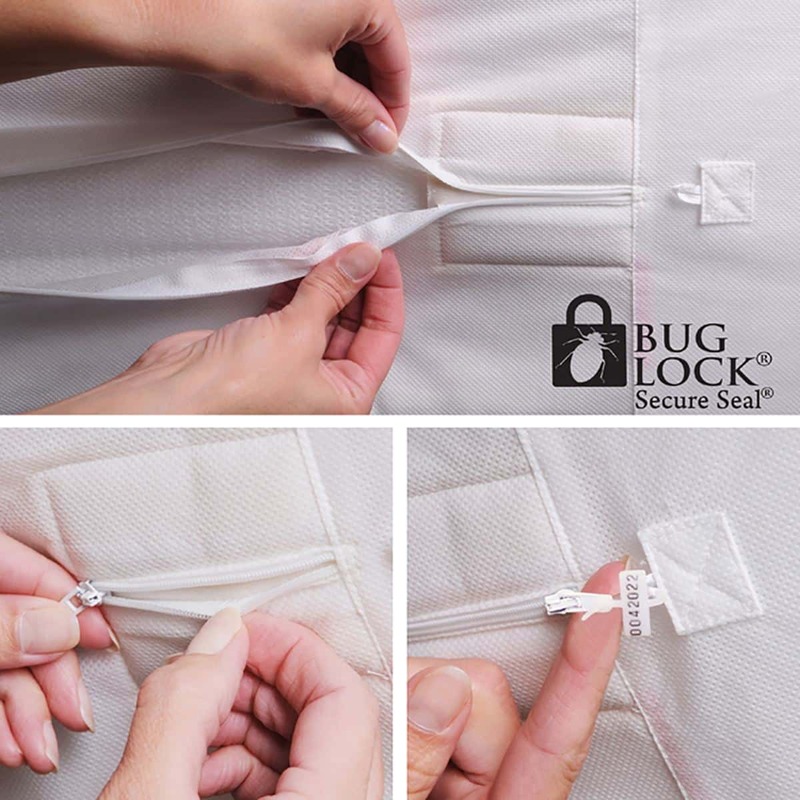 Extras: There are small ties that come with your encasement that allow you to fully close the protector around your mattress to completely prevent bed bugs. There are also detailed setup instructions on the packaging as well. There were very few negative reviews about the protector. 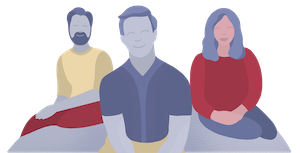 On both Amazon and Protect-A-Bed’s website, the biggest negatives were either customer service issues or issues navigating the website and understanding the product options. 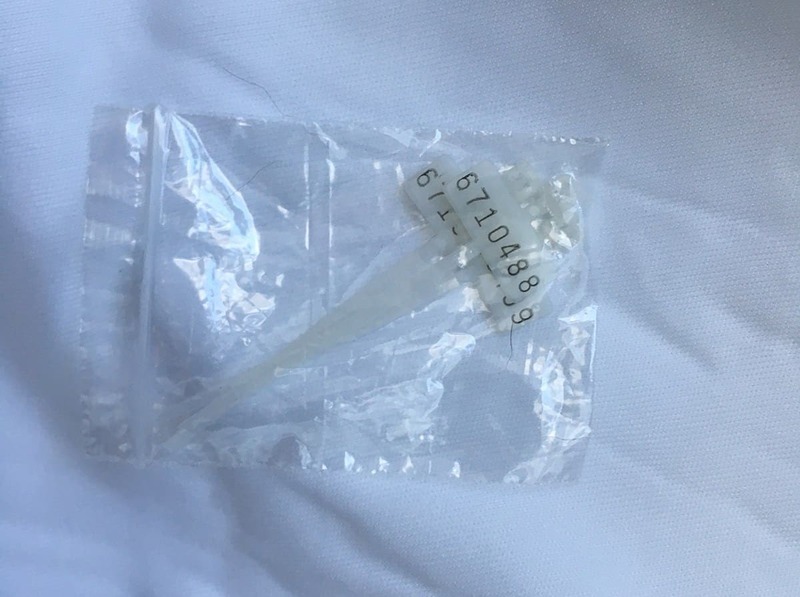 Most people seem happy with their purchase, although one customer had an issue with extra material and found that it wrinkled under her sheets. 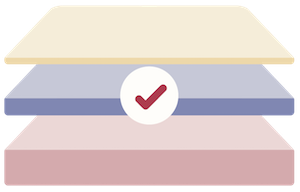 This was not my experience and I would encourage you to make sure you pick the correct depth from the two options available so you can get the closest fit to your mattress. 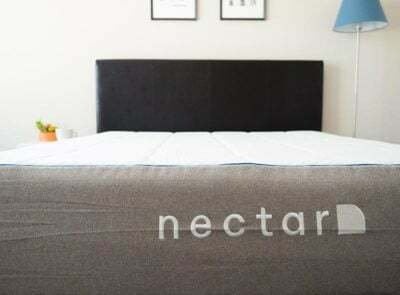 Overall, this encasement mattress does a great job of protecting your mattress from allergens, bed bugs, and water or other liquids. It is certified allergy and asthma friendly and lab tested for bed bugs. It comes with accessories to seal your mattress. It is machine washable and dryer friendly as well. 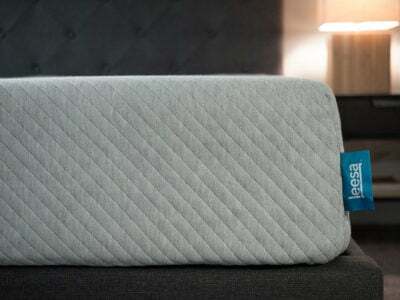 The price will set you back but not as much as buying a new mattress. The Protect-A-Bed’s AllerZip encasement mattress protector will run you nearly $130 for a Queen sized protector (with a 9-inch depth). This is around $100 more than the Sleep Defense System encasement protector I’ve also reviewed. You can also get it for closer to $100 on Amazon. 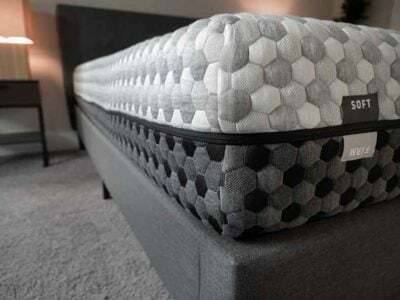 I think the protector is good quality and a lot of thought, testing and certifications have gone into producing it so that it really is allergy and asthma friendly and bed bug proof. If I had serious allergies and needed to make sure that my mattress was protected I would definitely consider this protector. 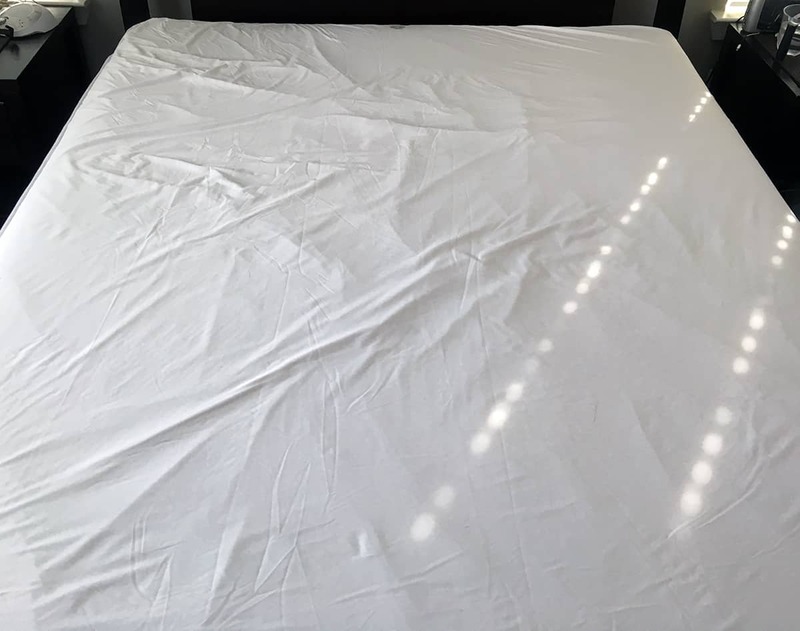 If allergens and/or bed bugs are not an issue and I wanted a protector that was intended to just keep spills and accidents off my mattress, I might consider a more affordable waterproof protector.